PPS Impact Magazine » To Appeal or Not to Appeal? Medicare denials have skyrocketed and an appeals hiatus has been put in place. What this means to physical therapy providers. Over the past several years, the escalating number of Medicare denials has resulted in a record number of appeals making their way to the 3rd Level Administrative Law Judge (ALJ). Appeals have skyrocketed in large part due to denials in the recovery audit program (RAC) and the successful resolutions providers are receiving at the ALJ level. The escalating number of cases reaching the Office of Medicare Hearing and Appeals (OMHA) has prompted Chief Judge Nancy Griswold to declare a temporary halt to the assignment of new cases to the various ALJ regions. An open letter to providers was published on the OMHA website in February, and an Appellate Forum was broadcast live on February 27, 2014, from Washington, D.C., to explain the circumstances leading to a dramatic halt in the appeals process for providers. I was present during the six hours of the live broadcast, as well as anchored live news coverage (with the permission of OMHA) via a webinar presented by RAC Monitor. Questions and answers address the effect of the backlog and appeals hiatus on the therapy practice. The delay that has now been formalized as a “deferred assignment process” by the OMHA may impact a decision to appeal by a therapy provider. 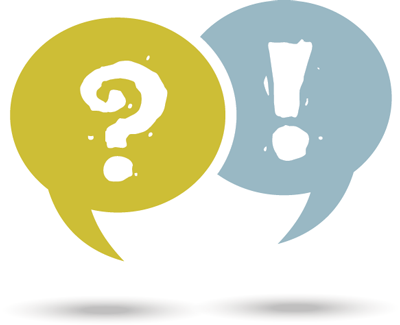 Q: Our clinic has received denials for multiple dates of services that exceeded the $3,700 therapy threshold. We have never received a denial and are unfamiliar with the appeals process. Do you have any recommendations on how to get ready for an appeal? A: Your denial letter from the Medicare Administrative Contractors (MAC) will advise you of the findings of the Recovery Auditor (RAC) and advise you of your appeal rights and the timelines for filing an appeal. The first resource should be the MAC’s website where you will find information on the appeals process, as well as links to the appeal forms. Noridian (JE and JE Medicare Administrative Contractor) provides a good resource page for appeals with links to the appropriate forms and information required at each level. Prior to filing the appeal you should consider the nature of the denial, and any information that you have to refute or challenge the denial. For example if the denial was received because the plan of care (or updated plan of care) was not certified, you will have a strong case if you can provide a timely certification, or a late certification obtained according to CMS guidelines. If your denial was due to lack of medical necessity, you should review the documentation to challenge the lack of medical necessity decision. Best practice would be to create a summary cover letter that reviews the entire episode of care and index the evidence of medical necessity of skilled care in the medical records that you are submitting with the appeal. 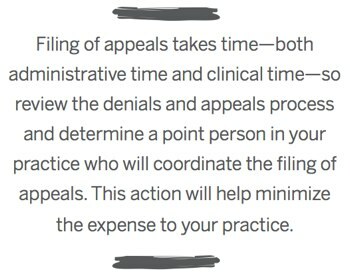 Filing of appeals takes time—both administrative time and clinical time—so review the denials and appeals process and determine a point person in your practice who will coordinate the filing of appeals. 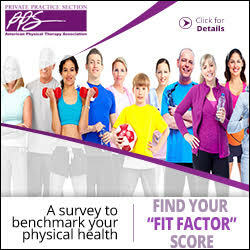 This action will help minimize the expense to your practice. Q: What is a reopening, and when can that be used? A: Reopening refers to the request for Medicare to reopen the claim so the error or omission can be corrected, rather than go through the appeal process. It will save you the necessity to request an appeal (redetermination) if you believe you have made a minor error or omission when filing the claim, which caused the claim to be denied. Check your MAC’s website to review the various reopening methods. Keep in mind—due to timely filing requirements—that you have one year to request a reopening from the date on the Remittance Advice (RA). The most frequent reason a therapy clinic would use reopening is to correct and/or add a modifier: a -59 modifier to indicate that two procedures were performed in separate and distinct time frames or to add a KX modifier to therapy over the cap to attest that it was medically necessary. Other reasons that a clinic might utilize a reopening include: transposed procedure or diagnostic codes, duplicate claim denials (when not a duplicate claim), or other inaccurate data entry mistakes. 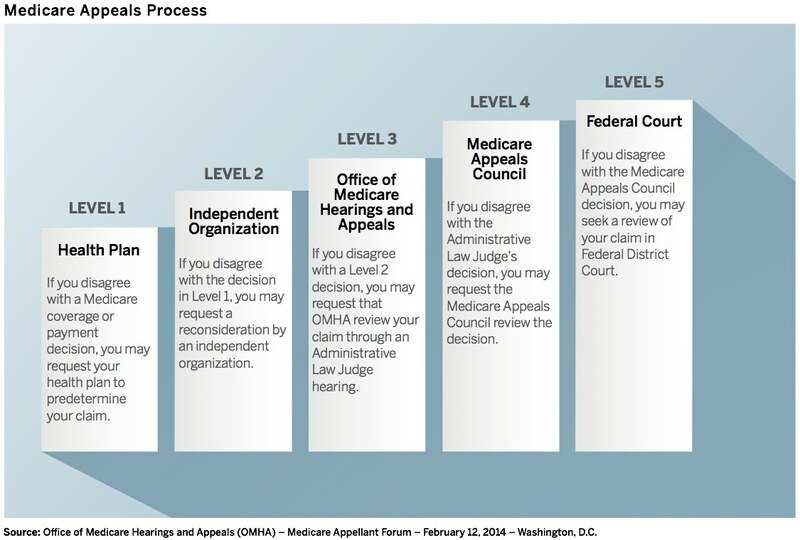 Q: If we are appealing a Medicare denial, will we have to pay Medicare back while our appeal is pending? A: Limitation on Recoupment (which is often referred to as “935”) does not begin if a valid redetermination (1st level of appeals) request is received within 30 days. Recoupment starts between 61 and 76 days after the redetermination. However, recoupment does not begin if a valid reconsideration (2nd level of appeals) request is received within 60 days. Recoupment stops when the QIC (2nd level of appeals) notifies the contractor that a valid request for a reconsideration has been received. Keep in mind that recoupment resumes 30 days after the QIC (2nd level of appeals) reconsideration, regardless of an ALJ hearing request (3rd level of appeals) that you submit. Q: After reviewing some of our RAC denials, we do not feel that our documentation supports medical necessity. Can we choose not to appeal? A: A provider can choose whether or not to make an appeal and should do so after reviewing the entire medical record to determine if there is a strong case for the appeal. Providers should also balance the cost of the appeals process, including the necessary time to obtain a hearing with an administrative law judge—often considered the best chance to win an appeal. If aiming for the ALJ level, your money will be recouped (in an RAC post-payment review state) before you get a hearing scheduled. Your consideration may be different if you are in an RAC prepayment review state, as you are appealing to be paid, rather than having to repay an amount that has already been paid to your clinic. Q: Our clinic has appealed several denials from the manual medical review program by the RACs and have been denied at the 1st and 2nd level of appeals. We immediately submitted an appeal to the ALJ, but we have not received notice of an ALJ hearing. What is the reason for the delay in the appeals process? A: The Office of Medicare Hearings and Appeals (OMHA) has experienced a dramatic workload increase over the past several years in large part due to the continuing expansion of all post-payment audit programs (such as the RAC program), increased activity from State Medicaid Agencies, as well as the increase in Medicare beneficiaries. Despite the increased demand, the resources of OMHA virtually remained the same. OMHA received 117,371 requests for appeals in 2012, which ballooned to 350,629 in 2013. Do not attach medical records or other documentary evidence to your request for an Administrative Law Judge (ALJ) hearing. Your submission should be limited to the Request for ALJ hearing form itself. 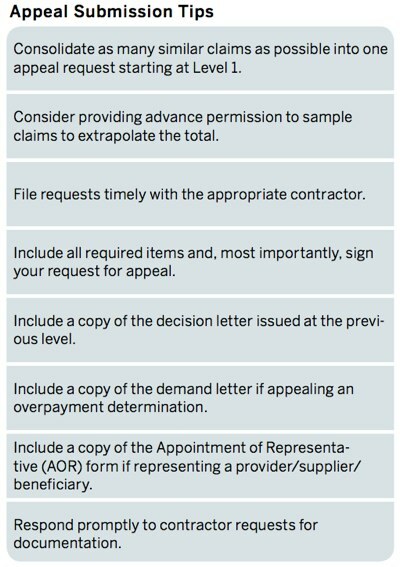 Clearly list the Medicare Appeal Number for the Reconsideration you are appealing on your Request for ALJ hearing form. Alternatively, you may include a copy of the first page of your reconsideration decision. If you are appealing a reconsideration issued by a Qualified Independent Contractor (QIC), do not submit a courtesy copy of your request for ALJ hearing to the QIC that issued your reconsideration or to the Medicare Administrative Contractor (MAC) who issued your redetermination. Do not re-submit medical records or other documentary evidence you already submitted earlier in the claim submission or to another level of appeal. When you request an ALJ hearing, OMHA coordinates directly with the prior level of appeal to obtain the administrative record, which includes everything you already submitted. Duplicate evidence will not be considered. Q: What about appeals that were afforded to beneficiaries under the Jimmo Settlement? A: Under the Jimmo v. Sebelius Class Action Settlement Agreement Medicare beneficiaries that were denied care using an improvement standard are afforded the ability to file a re-review of that decision. CMS has provided a form for this process. The ability to appeal is limited to beneficiaries, and providers are not able to use this venue to appeal “maintenance” denials. If the beneficiary maintenance care denial became final and non-appealable in the period of January 25, 2013 through January 23, 2014, then a request for a re-review must be postmarked by January 23, 2015. The timeframe for filing appeals for maintenance denials from January 18, 2011 through January 24, 2013 has expired. The Center for Medicare Advocacy lead plaintiff attorneys have also provided self-help packets for beneficiaries at their website: www.medicareadvocacy.org/take-action/self-help-packets-for-medicare-appeals. Nancy J. Beckley, MS, MBA, CHC, is certified in health care compliance by the Compliance Certification Board, and is a frequent speaker and author on outpatient therapy compliance topics. She advises practices on compliance plan development and audit response. Questions and comments can be directed to nancy@nancybeckley.com. 1. Website: www.hhs.gov/omha/letter_to_medicare_appellants_from_the_calj.pdf Accessed August 2014. 2. Website: www.hhs.gov/omha/omha_medicare_appellant_forum_brochure.pdf Accessed August 2014. 3. Website: www.noridianmedicare.com/partb/appeals/ Accessed August 2014. 4. Website www.hhs.gov/omha/letter_to_medicare_appellants_from_the_calj.pdf Accessed August 2014. 6. Website www.q2a.com/Portals/0/JIMMO_REREVIEWFORM-508.pdf Accessed August 2014. Note: Refer to Impact, July 2014 Compliance Column for a discussion of the Jimmo v. Sebelius Settlement.